PAWA Magazine is proud to spotlight Purple Community Fund – one of the projects supported by monies raised by PAWA through our events and charity challenges. In this brief introduction, we see the women and girls of Purple Community Fund with a championing letter sent by our PAWA London team and we learn from PAWA’s Projects Team Leader Phyllis Hatfull about how the funds have helped this project. Purple Community Fund helps poverty stricken families and communities in the Philippines, Tanzania and the UK transform their own lives with skills training, education, health and nutrition programmes. We sent our letter of congratulations to the young women of Purple Community Fund by email in September. Beyond confirming PAWA’s funding to them, our London team wanted to share some encouraging words and champion these young women on their path towards a brighter future. The letter is usually translated for the girls at each project and we often get some nice comments back. 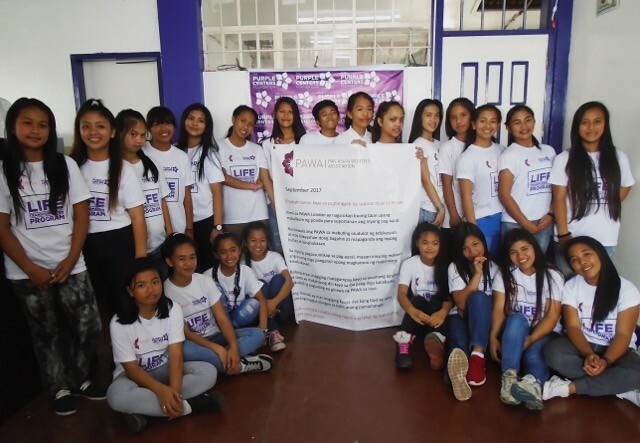 We have been funding Purple Community Fund this year for a series of workshops for their Life Transformation Program in Baguio City in the Philippines. Fifty teenage girls have been participating. There are two areas: Hygiene & Wellness and Leadership & Values. The girls learn about how to stand up for themselves in abusive relationships, how to deal with natural disasters and how to express themselves as well as practical skills such as good self hygiene, self-sufficiency and resilience. They each receive a hygiene kit. “Many congratulations on receiving PAWA funding! We, the PAWA team in London, work hard throughout the year to raise funds to support your education. PAWA believes in the positive power of education. It can and will improve your life and future. Through hard work and study you can have a bright future and fulfill your dreams.Someday you could be successful enough to help other young women, just as PAWA has helped you. The world will become a better place through the small contributions we can all make. Phyllis Hatfull is PAWA’s Vice-Chair of the Management Committee and also PAWA’s Charity Projects’ Team Leader. Her fellow Charity Team members are Helen Spillett and Nadhrah Rafiq.